Originally published in The Patriot-News on Dec. 7, 2011. Patricia Behrens woke up to the sound of explosions. It was about 7 a.m. on Dec. 7, 1941, in Hawaii. The U.S. military reservation had a habit of waking residents up with its drills. “Why do they do it Sunday mornings?” Behrens said. Wide awake, she left her bedroom and walked to where her mother stood, by the door of their home. Behrens, now Patricia Cameron, 86, and a resident of Camp Hill, was 16 when the Japanese attacked Pearl Harbor. She was a senior at Punahou School in Honolulu and lived in a suburb in the Monoa Valley with her mother. They had moved to Hawaii to be closer to her father, the executive officer on the USS Concord stationed in Pearl Harbor. The night of Dec. 6 was a night like any other. Cameron even had plans for the next day. She was meeting up with a serviceman who was stationed at Pearl Harbor. Cameron has a clear memory of sitting in her bedroom reading George Bernard Shaw’s “Plays Unpleasant” that night before falling asleep. Everything was normal. The morning would be anything but. She never finished the book. And it would be 10 days before she heard whether her Navy friend was even alive. As Cameron stood with her mother, a neighbor’s door opened. A man ran out, put on his Navy uniform, hopped into his car and sped off. Soon Navy officers poured into the street from their homes and ran toward Pearl Harbor. Cameron’s own father was off the coast of South America that day. So it was just Cameron, her mother and their Japanese maid in the home when the news came that Japanese paratroopers were thought to have landed in the hills behind their house. A blackout policy was implemented, so when the sun set the entire community was plunged into darkness. Cameron’s family had a radio, which had a small monitor that lit up when turned on. It was roughly the size of the space between her outstretched thumb and pointer finger. They were listening to it one night in the dark, trying to get news of the outside world and piece together what was happening when there was a knock at the door. The knocker was the air warden. “You are showing a light,” he said. From then on the radio was covered in a blanket when turned on, its low voices and sounds murmuring in the dark. A few days after the attack Cameron’s father was able to get a call through to Hawaii. But just as the town was kept in blackness at night, so the outside world was kept in the dark on information about Pearl Harbor. Within the first three days, Queens Hospital put a call out for blood donations. Cameron and her mother immediately went to donate. But there was a problem, donors were supposed to be 17 years old. Cameron was only 16. Before the attacks had even begun, Cameron and her mother had purchased tickets to California for Christmas. Her father was going to be stationed in San Francisco for the holiday and they were going to join him. Those plans had definitely not changed in light of the attack. Cameron and her mother had to go to the Pearl Harbor to pick up the paperwork allowing them to leave. On Dec. 20, 1941, Cameron was on the first convoy that left Hawaii for California. The ship’s passengers were triple the usual number, the numbers inflated by people fleeing the Philippines and the 100 worst burn cases from Pearl Harbor. The journey was one of trepidation. “There was no guarantee we would make it safely to California because that had not yet been accomplished,” Cameron said. As the ship neared California, Japanese submarines were spotted off the coast of Los Angeles. The passengers spent Christmas Eve in life jackets. On Christmas morning 1941, they sailed under the Golden Gate Bridge and stepped foot on California soil. Cameron and her family never went back to Hawaii. In 1942, Cameron was in Philadelphia, studying at the Friends School when she received a letter from Punahou, her Hawaiian school, stating she could still have a Punahou diploma. Cameron received two high school diplomas from schools 6,000 miles apart. 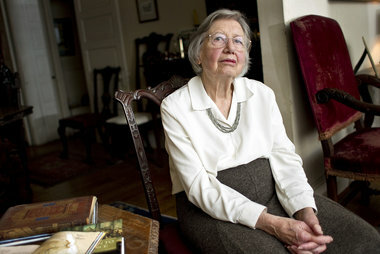 Patricia Cameron, 86, is the founder of St. Stephen’s Episcopal School in Harrisburg. She currently resides in Camp Hill with her husband Duryea Cameron. The Dauphin County Historical Society was instrumental in getting this interview.